From 1919-1933 this dynamic German school changed art education throughout the world forever. That’s a pretty bold statement, we know, but it happens to be the total truth. Founded by Walter Gropius after his close encounter with the afterlife in a chimney shaft during World War I, the ultimate goal of the school was to epitomize Architecture. From his manifesto illustration to his hiring choices and even the name of the school and its workshops, Walter Gropius sought to create a 20th century cohesion between traditional craft and new age technology. The school began in Weimar, transitioned to the location designed by Gropius in Dessau and ended in Berlin under the direction of Mies van der Rohe. Among the masters who taught there are the greatest names in Modernism - from Wassily Kandinsky to Joseph Albers (later of NC’s Black Mountain College), Hannes Meyer, Paul Klee, Marcel Breuer, and Laszlo Maholy-Nagy. While it only lasted a few short years, the methods developed amidst Germany’s political turmoil have inspired artists, furniture designers, textile weavers, and architects the world over and the “Bauhaus” style continues to be synonymous with clean color-blocks, unadorned facades, and practical objets that we take design queues from on a regular basis. Since we obviously can’t cover the entire fascinating history of the Bauhaus in one itty bitty blog post, here are a few lesser known highlights we dig and think you will too! 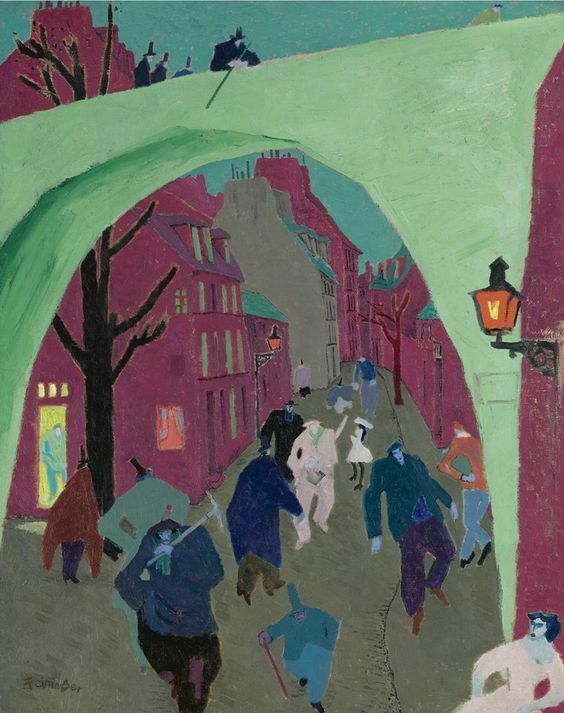 Lyonel Feininger's "The Green Bridge"
One of the few Americans present at the school, Lyonel Feininger was already a well known cartoonist in both the US and abroad when he joined forces with Gropius. Locally, you can view his masterpiece “The Green Bridge” at the North Carolina Museum of Art and through it understand why his work as an expressionist has been so revered. Architecturally inspired, with political angst infused, the color palette of this painting alone will draw you in and increase your curiosity about this particular Bauhaus “Master”. Otti Berger was a woman well ahead of her times. Born in what is present day Croatia in 1898, she was one of the most advanced textile weavers in the school. After leaving Dessau, she opened her own Atelier where she developed sound absorbing fabrics and wallcoverings, copyrighting her own creations long before anyone else in the interior world had begun to develop such items. Most women at the Bauhaus were relegated to the weaving workshop as it was the traditional craft exclusively associated with females but Marianne Brandt stood out as a both a metalsmith and photomontage artist. Inspired by basic geometric forms and stylistically exploring topics of race, sexuality, and fashion, Marianne’s art is rarely seen in museums but many of her household items are still being produced en masse today.